Even though many super-tiny atomic particles exist, you only need to remember the three basic parts of an atom: electrons, protons, and neutrons. What are electrons, protons, and neutrons? 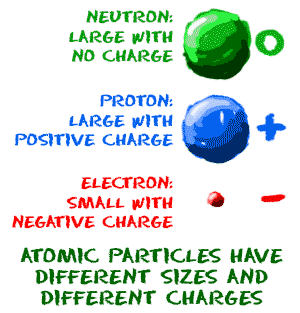 Electrons are the smallest of the three particles that make up atoms. 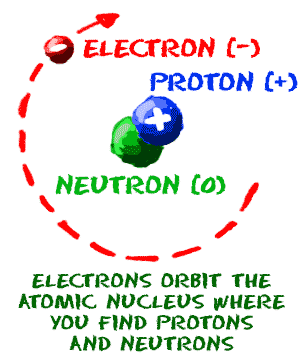 Electrons are found in shells or orbitals that surround the nucleus of an atom. Protons and neutrons are found in the nucleus. They group together in the center of the atom. That's all you have to remember. Three easy pieces! There are almost 120 known elements in the periodic table. (117 as we write this) Chemists and physicists are trying to make new ones every day in their labs. The atoms of different elements have different numbers of electrons, protons, and neutrons. Every element is unique and has an atomic number. That number tells you the number of protons in every atom of the element. The atomic number is also called the proton number. You can see that each part of the atom is labeled with a "+", "-", or a "0." Those symbols refer to the charge of the particle. Have you ever heard about getting a shock from a socket, static electricity, or lightning? Those are all related to electric charges. Charges are also found in tiny particles of matter. The electron always has a "-", or negative, charge. The proton always has a "+", or positive, charge. If the charge of an entire atom is "0", or neutral, there are equal numbers of positive and negative charges. Neutral atoms have equal numbers of electrons and protons. The third particle is the neutron. It has a neutral charge, also known as a charge of zero. Since the number of protons in an atom does not change, fewer or extra electrons can create a special atom called an ion. Cations have fewer electrons and have a positive charge. Anions have extra electrons that create a negative charge.